Have you ever thought of converting idle space into living space? A lot of homeowners have considered an attic renovation in order to increase the resale value of their home and also to make this area usable. You too can do the same but the only way this can happen is by using what you have on top of your existing home. But can you do this in your home? The truth is, not all homes can undergo an attic renovation. This is because not all attics have enough headroom directly under the ridge line and less than 7 ½ feet of headroom over at least half of the attic floor space. Also, it is difficult to have an attic renovation if the existing roof uses a “X” or “W” shaped frame. However in some cases, a contractor may find a way to work around this as long as the roof is supported by cross braces. Another thing you have to think about when you are considering an attic renovation is the structural integrity of your flooring. Keep in mind that the flooring here also serves as the ceiling of a room below. Should the floor joists be insufficient when you step on it, someone could fall down and get hurt. This is why you should assess the strength and suitability of the attic floor by contacting a professional to do the study. If these two things have been met, you can already plan what you want to do with your attic. Most homeowners who consider an attic renovation may convert this into a bedroom or playroom. This means providing sufficient insulation, lighting and ventilation to this room. 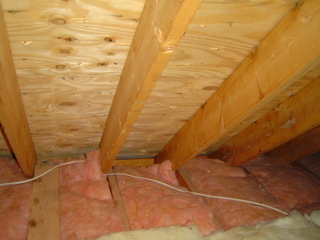 You can provide insulation by putting in additional layers to what is already present there. For lighting, you can install a skylight. As for ventilation, you can put a window so air is able to go in and out. Another thing that is related to flooring and part of attic conversion is accessibility. If the only way here was through a trap door or a pull down stairs, you will have to change it because this is prohibited. This has to be changed with stairs that is permanent measuring 2 feet by 6 feet that has handrails on both sides. You can also have only one handrail as long as the other side is opposite the wall. If you have no idea how to get this started, why don’t you look at home improvement or interior design magazines? You can even get a professional to help you plan it out because in the end, he or she can help put into drawing what you want done in your head. A few other ideas for those considering an attic renovation include making this into a gym, a home theater room, an art gallery or a stellar room. If you have other great ideas, go ahead and try them out so you can empty out this storage space. If you are considering an attic renovation, think about these two things. First, this project should not cost you a fortune. This means you don’t need additional foundation to make sure that this can be used as living space. Secondly, if you are able to get a return on your investment in the long term, then hiring someone to do the job is all worth it.